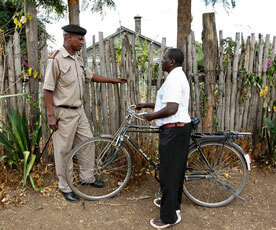 Chief Francis Kariuki, left, is shown a gap in a fence that thieves escaped through, by village elder Peter Ndungu, right, in the village of Lanet Umoja, Kenya. LANET UMOJA – When [Francis Kariuki], the administrative chief of this western Kenyan village received an urgent 4 a.m. call that thieves were invading a school teacher’s home, he sent a message on Twitter. Within minutes residents in this village of stone houses gathered outside the home, and the thugs fled. The tweet from Francis Kariuki was only his latest attempt to improve village life by using the micro-blogging site Twitter. Kariuki regularly sends out tweets about missing children and farm animals, showing that the power of social media has reached even into a dusty African village. Lanet Umoja is 100 miles west of the capital, Nairobi. “There is a brown and white sheep which has gone missing with a nylon rope around its neck and it belongs to Mwangi’s father,” he tweeted recently in the Swahili language. The sheep was soon recovered. Kariuki said that even the thieves in his village follow him on Twitter. Earlier this year, he tweeted about the theft of a cow, and later the cow was found abandoned, tied to a pole. Kariuki’s official Twitter page shows 300 followers, but the former teacher estimated that thousands of the 28,000 residents in his area receive the messages he sends out directly and indirectly. He said many of his constituents, mostly subsistence farmers, cannot afford to buy smart phones, but can access tweets through a third-party mobile phone application. Others forward the tweets via text message. Kariuki, 47, said that he has been able to bring down the crime rate in Lanet Umoja from near-daily reports of break-ins to no such crimes in recent weeks. He also uses Twitter to send messages of hope, especially for the young and unemployed. “Let’s be the kind of people that do good for others whether we get paid back or not, whether they say thank you or not,” one recent tweet said. Kariuki said he intends to use Twitter to promote peace as Kenya prepares to hold another presidential election in the next year, it’s first since the 2007-08 postelection violence that killed more than 1,000 people in Kenya. Kariuki said that when he was first appointed the administrative chief of Lanet Umoja he asked himself how he could tackle the region’s problems. First was solving the region’s poor communication infrastructure. He said he is currently setting guidelines to help him sift through the information he gets so that he does not send out incorrect tweets. “Information is power, but information can also be destructive. What we are trying to minimize is destructive information,” Kariuki said. OSAKA – Panasonic has decided to halt domestic production of its VCR, in what is becoming a regular occurrence for Japanese electronics firms to stop selling outdated products. Like the Walkman before it and the minidisc player, the VCR seems like an iconic relic in an age when movies are streamed over the internet and recording content on tapes or discs are about as outdated as fax machines. But Panasonic said it stopped producing VCRs for the domestic market only at the end of last year. Once they run out of inventory, it will stop sales of VCRs in Japan entirely, the company was quoted as saying Monday. Panasonic, however, still manufactures VCRs at factories in China and Slovakia. A spokesman said Panasonic will continue selling VCRs abroad based on market conditions. Panasonic started selling VHS-tape VCRs in Japan in 1977 — one of the first Japanese manufacturers to introduce the product. 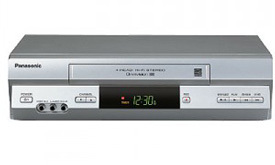 The first VHS-tape VCR was introduced by the Victor Company of Japan, a majority-owned subsidiary of Panasonic that has since merged with audiomaker Kenwood to form JVC Kenwood Holdings. A JVC Kenwood spokesman said the company stopped in-house production of VCRs in 2006 and it has since stopped selling VCRs entirely. For much of the 1980s and 1990s, the VCR was a must-have home electronics appliance after a format-war between VHS and Sony’s Betamax swung in favor of the VHS tapes. Moreover, it helped to create a new, lucrative business for movie studios and opened the door for an industry of video-rental shops. While DVDs replaced VHS tapes as the video media of choice in the early 2000s, VHS tapes still clutter many a home across the world. CleanSpace One chasing its target. Image released Feb. 15, 2012. GENEVA – Swiss scientists said Wednesday they plan to launch a “janitor satellite” specially designed to get rid of orbiting debris known as space junk. The $11-million satellite called CleanSpace One – the prototype for a family of such satellites – is being built by the Swiss Space Center at the Swiss Federal Institute for Technology in Lausanne, or EPFL. The debris travels at speeds approaching 17,500 miles per hour, fast enough to destroy or inflict costly and time-draining damage on a satellite or spacecraft. 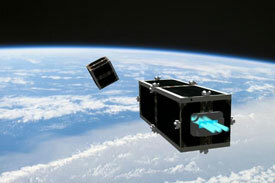 Collisions, in turn, generate more fragments floating in space. “It has become essential to be aware of the existence of this debris and the risks that are run by its proliferation,” said Claude Nicollier, an astronaut and EPFL professor. And, finally, CleanSpace One has to be able to take the debris, or unwanted satellites, back into Earth’s atmosphere, where they will burn on re-entry. b) What is subsistence farming? c) How do farmers who can’t afford to buy smart phones get tweets from the administrative chief of Lanet Umoja? b) Panasonic still manufactures VCRs at factories in China and Slovakia. How will the company determine when to end overseas VCR sales? b) How many pieces of space junk is NASA tracking? c) Why is there a concern over space junk? A recent report said that Twitter is enjoying big growth across Africa. It said South Africans use Twitter the most, but Kenya is second in usage on the continent. The research by Kenya-based Portland Communications and Tweetminster found that over the last three months of 2011, Kenyans produced nearly 2.5 million tweets. More than 80 percent of those polled in that research said they mainly used Twitter for communicating with friends, 68 percent said they use it to monitor news. Beatrice Karanja, the head of Portland Nairobi, said the findings show that the use of Twitter is part of a revolution for governments that want to open dialogue with their citizens and businesses that want to talk with their consumers. Erik Hersman, a co-founder of internationally acclaimed Ushahidi, a nonprofit technology company, said Kariuki’s use of Twitter is a great example of how Kenyans in even the most remote areas can embrace social media.